Early this week, Jarrett was extremely enthusiastic about going to the movies. It seemed strange to me that he was excited about going, given how he considers movie theaters to generally be a waste of money. I responded enthusiastically though, eager to get a chance at a movie date we hadn’t been on in a while. 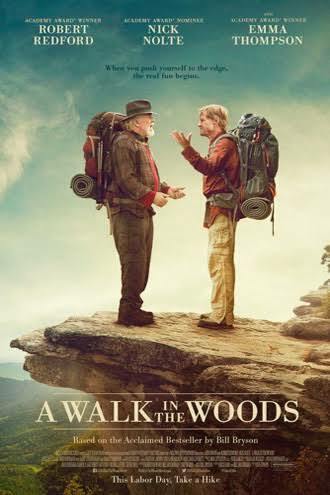 On the way to the movies, Jarrett explained to me that A Walk in the Woods was about the wilderness and he was excited about the movie because of the panoramic views of the Appalachian trails. When we entered the theater, only three other couples were there. We should have taken that as a sign that this movie was not going to be as entertaining as we hoped it would be, but we didn’t. The movie is inspirational, and at times very funny. It stars Robert Redford as Bill Bryson, a famous travel writer, and Nick Nolte as Stephen Katz, Bryson’s former frenemy and a recovering alcoholic. In the movie, both are past their sixties when they set out to hike the entire Appalachian trails. As someone already dealing with arthritis, the thought of this premise made my hips and knees hurt, but I have to say that many of the scenes from this movie inspired me to make another effort to get out there and explore the beauty of nature once again. I mean, if men who are forty years older than me are willing to make an effort to walk the Appalachian trails, what’s stopping many of us young people, with or without chronic illnesses, from attempting to go out and explore the world? As for the comedy, I enjoyed that it felt very natural. I could see the people and the situations presented as actual people and situations we all encounter at some point in our lives. I guess this makes sense, considering the book is based on actual events that occurred to travel writer Bill Bryson, but in any case, it makes the movie very relatable to people of all generations. The movie made me question whether it was worth the price of movie tickets. It felt like a low-cost production at times, particularly in the scenes where the viewer is supposed to see great sights in the background, but instead sees a very obviously painted backdrop. For a movie about the outdoors, you’d think it would have invested more in its scenes of nature. I also did not feel like Redford and Nolte had chemistry as old frenemies. Maybe that was intended, but it made me feel like I was watching two inexperienced actors in a telenovela than two of the world’s greatest actors in a movie. You’d be better off waiting for the movie on Netflix or Amazon Prime, or any other movie-streaming or rental service, maybe even a television broadcast. It’s good for a nice relaxing day-time movie watching. Let us know your thoughts on the movie A Walk in the Woods or your favorite movie about the Appalachian Trail. Also, Make sure to keep up to date on all our adventures by following us on Facebook. Who is the author of this review? You or your significant other? Anyway, I was confused. I do appreciate the review and will take it under advisement. Thanks. It was written by my wife Linda. She is tagged in the labels of the full site, but as I just learned labels don't appear on the mobile site. Thanks bringing this to my attention. Thanks for the review! I thought it was a decent film for what it is and I hope they do release it to Netflix soon so I can watch it again.